The focus of this year’s performance was on a multidisciplinary approach and consisted of three completely different evenings of triple bills showcasing works involving theatre, music, puppetry, architecture, and film. The curated artists and their collaborators have each developed a short piece around an existing or newly created archive. The collaborative intention of the curator and participating artists was to rethink their own perceptions of dance performance, in the context of multimedia collaborations and introduce the concept of a “Thinking Dancer” within the local culture of dance spectatorship. 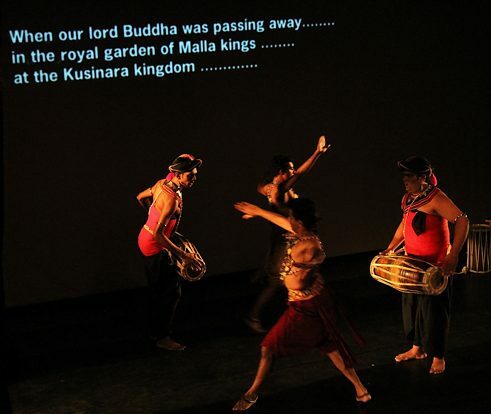 Featured artists: Ravibandu Vidyapathy, Kapila Palihawadana, Upendra Malith (Natanda Dance Theatre of Sri Lanka), Niloufer Pieris, Floating Space, Mahesh Umagiliya, Nilan Maligaspe, Venuri Perera, Sulochana Dissanayake and T. Shanaathanan.